" Keep Stacking Charlie Say's Hello!! " And yet there is still a CONTEXT thereof. Otherwise “repentance” and forgiveness would have absolutely no impact upon same, Correct? Indeed, the choices One makes will undoubtedly, and eventually lead to a “predetermined” outcome foreseen by Our Creator. Nevertheless there is an 'escape hatch' available to those who truly repent, and turn to Our Saviour for Saving Grace. Agreed, context is important, essential. I am really not a Calvinist, long, long discussion. Don’t disagree with Calvin just more of a 5 point ‘Spurgeonist’ if there is such a thing. I believe in Free will, repentance and Faith. How they are all ultimately reconciled against predestination is above my pay grade. I hear you SS, salvation is all of God, 100% yet this is a long topic almost irreconcilable imho. They both are true, God's sovereignty and mankind's free will. True love makes no sense in the absence of Free will. @IRB that sermon you posted is probably one of the most downloaded from Sermon Audio. Have had it on my ipod for some time, thanks, all should listen if you have not already. Ten Shekels And A Shirt by Paris Reidhead. You hang in there little Brother and just remember, for every step you take towards the LORD, He'll take One Hundred towards you, and realize that there is indeed a purpose and serious reason behind how and through whom the LORD works in this Life/ World, and there are indeed unpleasant tasks which the Poet and Placaters are not cut out to fulfill, of which there is not an abundance of volunteers for same, as most wouldn't desire, much less choose to rock the "P.C." boat, or the Status Quo and their sycophants wherever they might appear. Thanks for the encouragement, Mr. Rex! Had to look up 'placate'. Was happy to find Webster and I were in agreement. So sit up straight, take notice and learn. Perhaps Proverbs 13:20? As Daystar would say: Yes, Sir. (Do you remember that day, Rex?) Well, I sure do .. and to this day his example (think ...arrow) 'sticks fast in me'. It's easy to spot the the latter, but only after and when One has indeed done their homework. Therefore grasp Proverbs 4:7 as well ... Check. Do not let yourself be led astray by those whom you might perceive to be your friend, or otherwise as an “enlightened” teacher, for they are but ravenous wolves in sheep's clothing. ... I understand your sentiment but am trusting that Christ is jealous over me, and will not allow me to follow any voice but His. The trouble with my writing is that it is always fraught with imperfection, and therefore prone to misinterpretation. Perhaps the word 'very' is superfluous ... Perhaps I should have said 'acquaintance' instead of 'knowledge. Nevertheless, what I was attempting to express to GL stands. Placate? ... Maybe. Love? ...Hopefully. Obedience? Healing? ...Certainly were the targets I was aiming for. Oh, by the way, Rex, I was cringing a bit when I first saw your Post this morning. I thought you might be going to lambaste me for the Entry titled "Somebody has to say it" but, as usual, you have once again treated me kindly! For this, I thank you. My favorite people in all the world are '5 point Spurgeonists'! He was passionately against the Judaization of the Church. the body of the Church. We must first root this ailment out and then take thought for matters outside; we must first cure our own and then be concerned for others who are strangers... When there was need to observe the Law, they trampled it under foot. Now that the Law has ceased to bind, they obstinately strive to observe it... For he said: "Learn from me for I am meek and humble of heart", and "Take my yoke upon you, for my yoke is sweet and my burden light". Listening to Op.41 .... Simply beautiful. ...I visit www.barnhardt.biz every now and then. Beautiful music like you posted above .. Classic religious art .. Intelligent, no-holds-barred (from RCC perspective)* blogposts .. by a woman who has truly lost much in her service of Christ by/from adhering to her Faith. * Example: I read her defense of why she will never leave the Catholic Church no matter which man sits as Pope, or how infested it is with Marxists and homosexuals. It was quite remarkable. "He was passionately against the Judaization of the Church", is a major problem for the believers in these end times. I have been dealing with the many Christians who are backsliding, back past the Cross, and falling into the outside of a temple that does not exist. I was planning to address this issue on my next Sunday's post to the Church. The "born again " believers who are seeking their Jewish Roots will be in big trouble as they deny the Finished Work of the Cross and are deceived by Satan. Yes they all read the book of Galatians, a bible believing assembly, and have zero understanding of the Church/the Body/the Word/ and the the stinging death of being under the law. Have we noticed the great attraction these days, by the steeple houses, as they want anything and everything Jewish? Have we seen the infiltration of the rabbi's on the tube, the authors like Cain and how the pastors are even dressing in Jewish costume? It is difficult to be nice when confronting these enemies of the Cross! Yes enemies! WAKE UP CHURCH, REPENT AND RETURN TO JESUS, THE AUTHOR AND FINISHER OF OUR FAITH! We come against this lie of Satan in the Name of Jesus! John Johnson III of the Corinth Missionary Baptist church in Bullard, Texas, came face-to-face with Rasheed Abdul Aziz, 40, after morning services Sept. 13. Aziz was wielding a handgun and wearing camouflage pants, a tactical vest, combat boots and a helmet when he allegedly said “People are going to die today,” KLTV-7 reported Monday. “Immediately my mind went to the fact that I knew we had several children and young members that were playing and running in the fellowship hall, I mouthed to them, ‘This man has a weapon, I need you guys to go,’” Johnson, 45, told the station. Johnson, a former parole officer who works with troubled teens and is trained to diffuse verbal altercations, told the Tyler Morning Telegraph on Tuesday his instincts took over in his church’s conference room. The whole exchange took roughly five minutes. “Like clockwork, it kicked in,” he told the newspaper. When the church cleared out and an opportunity presented itself, Johnson then was able to leave without resistance from Aziz. Cops picked the man up shortly thereafter, but not before he left a note thanking the Johnson for calming his mind. “My name is Rasheed, you helped me at a time of need, this house is blessed by God and all faiths,” the note read, the Tyler Morning Telegraph reported. 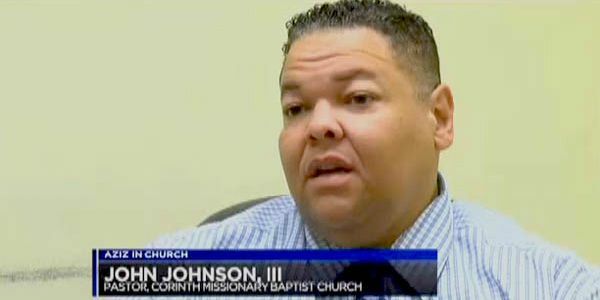 “I believe that his intent was when he came to our church was to actually kill somebody,” Johnson said, the newspaper reported. Aziz is charged with felon in possession of a firearm and is being held in the Smith County Jail, KSLA-12 News reported Monday. The disenfranchment of the elders. "9 Holding fast the faithful word as he hath been taught, that he may be able by sound doctrine both to exhort and to convince the gainsayers." Jim is spot-on that there is a huge problem in the steeple houses today. And yes, disenfranchisement of the elders is part of that problem, but I submit it is a symptom rather than the root cause.
" My people are destroyed for lack of knowledge..."
My rant from a week ago quoted in part 2 Tim 4:3: "For the time will come when they will not endure sound doctrine; but after their own lusts shall they heap to themselves teachers, having itching ears;". What's ailing the Body of believers today is that we have become complacent and tolerant of what we're being fed from the pulpits. While we should be desiring spiritual filet mignon, we've let the message be watered down past the point of even being considered milk. Even worse, doctrines of devils have infiltrated the ecclesiastia which have not been confronted. Why is this? In large part, this is because people wouldn't know sound doctrine if it hit them in the face. Most steeple houses aren't teaching--they're delivering some feel-good message intentionally crafted so as not to offend the pew warmers checking in on Sundays. Additionally, people aren't studying the Word for themselves nor testing what is being presented as a "christian" message. Wolves have slipped in unaware--and the Body doesn't know what a real sheep looks like so as to identify which of these is not like the other. Likewise, many born again believers have stopped studying scripture to explore the deep things of God. We've lost our love of understanding what He has done for us and how...what all of it means...what purpose He has in authoring and perfecting our faith. But back to Jim's point, the elders (and others gifted with spiritual knowledge, wisdom and discernment) have disenfranchised themselves by not standing up to these things. Sound teaching, reproof, correction and instruction aren't happening out of fear of being divisive or offensive. Well, the only problem with that is that the Word of God IS divisive and offensive. It offends our sin nature. It hurts our pride when we are corrected. Hebrews 4:12, "For the word of God is quick, and powerful, and sharper than any two-edged sword, piercing even to the dividing asunder of soul and spirit, and of the joints and marrow, and is a discerner of the thoughts and intents of the heart." Notice the language here--it isn't a comfortable process. But just because correction isn't comfortable is no excuse NOT to instruct, correct and reprove. What should we do? 2 Timothy 2:15: "Study to shew thyself approved unto God, a workman that needeth not to be ashamed, rightly dividing the word of truth." Study what? 2 Tim 3:16-17: "All scripture is given by inspiration of God, and is profitable for doctrine, for reproof, for correction, for instruction in righteousness: That the man of God may be perfect, thoroughly furnished unto all good works." And elders: 2 Timothy 4:2: "Preach the word; be instant in season, out of season; reprove, rebuke, exhort with all longsuffering and doctrine." Search the scriptures to see if these things are true. Test all things, hold onto the good. Amen and amen! A few years ago we had to leave our local congregation of many years as some began to veer off into a mystical path yet attempt to "Christianize" it and convince us that it was Scriptural. And NWV, the elders did not do their duty and hold those deceivers accountable, no, they claimed they did not even see the problem! Some women in the congregation stated they longed for "more" than "just" the Word of God, they wanted experience. Some people clearly saw the error and left after trying to voice warnings, others did not. But you know what, that SH is now weak, small, ineffective, and who knows what it stand for. Whenever you minimize Christ's finished work on the cross, or preach that there is more to the gospel then that, Satan has a foothold! We must be vigilent, all of us are susceptible to deception. We now attend a church where the elders are strong, Godly men and fiercely protect the doctrine, but we continually pray for them lest they become prideful or otherwise deceived. I know our pastor has a target on his back for preaching what the culture despises, that all have sinned yet Christ offers salvation as a free gift....that man cannot save himself. And that in response to this gift, we now will have morals and standards based on His Word, which is for our good and His glory. STORY: A few years ago, we were taking a cruise and I noticed that there were several people on the upper deck who were reading books. I sat by a woman to find out what they were studying. It was a prosperity gospel book by one of the slicked back haired preachers. You know, how to become wealthy as God fills your bank account. I tried to talk to the lady about the huge dangers of entering into that doctrine. Nope, closed to any view except a formula for wealth. Eph. 2:8 For by grace are ye saved through faith and not of yourselves; it is the gift of God. Eph. 5:4 You who are trying to be justified by the law have been alienated from Christ; you have fallen away from grace. Now this is serious stuff if one expects to enter the Kingdom. The people that I have encountered, that are attending meeting and trying to discover their Jewish Roots, are also blind and cannot hear any warnings, standing at the pit of a graceless plunge into eternity. If you are attending these Jewish meeting and especially those who are led by blind pastors, run for your lives, back to the finished work of the Cross, which you have departed from. One thing that we have stated before and will state again. You do not have any Jewish Roots. When the Jews finally build their third temple (if they do) and set up animal sacrifices, the backslidden Jewish roots movement will buy tickets to Israel. They will walk up to the temple mount, knock on the door of the temple, saying: "Hi, we are here to worship with our brothers the Jews and be included in all of your festivals and sacrifices. We want to be included in all the readings from the Torah and see the Ark of the Covenant" The doorkeeper will say: "Well, you have been deceived. You are gentiles, outside of our covenant with God. You are lost in your sins and hell awaits you. You are not welcome within our walls and never were in the previous temples which you gentiles destroyed. Depart from our temple or we will call the temple police. You do not have Jewish Roots but gentile roots, find your salvation through your own methods". A quote, "Instead of chasing after the experiences and traditions of men we should rather delve deeply into the Word of God and live out the experiences He has designed for His followers." The doorkeeper will say: "
Their position on what/who qualifies as an 'animal' is clearly stated. For those who didn't see (or who don't have a vault subscription), the topic of the end-of-the-world and different Christian end-times views came up in yesterday evening's podcast thread. And because this is precisely an example of what I spoke about in my last post here (ie, sound teaching and standing up to errors in the Church), I'm bringing the topic here for more discussion. "The Lord was vague on purpose to keep us all guessing." Response: While the Lord may have been vague on purpose, it most certainly was not to keep us all guessing. God is not the author of confusion (1 Cor 14:33). "You can't put God in a box...I have spent 35 years studying Eschatology (Bible Prophecy). No one knows for sure is my opinion." Response: After 35 years of studying eschatology (which isn't ONLY Bible prophecy), one should have more than just an "opinion". Yes, no one knows the day or the hour--not even the Son. However, we are not in darkness, that that day should overtake us as a thief. We are all the children of light, and the children of the day: we are not of the night, nor of darkness. Furthermore, we are instructed to watch and be sober (1 Thess 5:4-6). If we are expected to watch, and that day WON'T overtake us as a thief, then we should know what to things to be watching for. [W]e will be here until "after" the tribulations of those days. Response: Scripture presents a different conclusion than this. If we agree on Christ's FINISHED work on the cross...what purpose does it serve to bring the Church through the tribulation? If the Bride (aka, the Church) is legally betrothed to Christ, why would He beat her up for 7 years before the marriage supper? It just doesn't make sense. To suggest that the tribulation has some type of purification purpose for the Church (the Body of Christ and the Bride of Christ), also suggests that His death on the cross wasn't complete in its redemptive effects on the Church. I started this post looking at 1 Thesselonians 4 & 5--one of two places in the NT where the topic of the rapture (aka, harpazo, aka the translation) is directly and specifically addressed by the Apostle Paul. Paul writes TWICE between 1 Thess 4:18 and 5:11 to comfort each other with these words (in 1 Thess) regarding our meeting Him in the air, not being appointed to wrath, and not being overtaken as a thief. How is it possible to comfort one another by saying the Church must go through the tribulation? It will be the worst time in earth's history--NOTHING in the past compares to how bad it will be. What's comforting in saying we (the Church, the Bride) must go through it? Again, it just doesn't make sense. I could literally write for a couple of days on that should be enough to start the discussion. What say ye? Shall we comfort ourselves together and edify one another? I read your post. It is very divisive. You say, "what say ye" We say why bring decisiveness to the Thread of Faith? My understanding is The Pre-trib was not taught for almost 1800 hundred years. IMO arguing this issue is not comforting. It has already been argued for decades and not resolved. Do you really want to divide this forum?